These ravioli do not have a speck of pasta in the recipe. 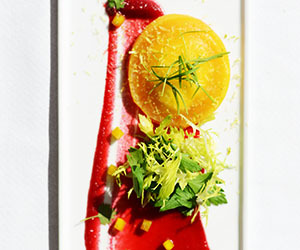 Instead, Chef Connelly sandwiches thin rounds of cooked yellow beets with goat cheese to create the “ravioli” and serves them on a bed of red-beet puree. The result is a colorful veggie-based appetizer. Divide water between 2 large saucepans. Into one saucepan, add the white vinegar and 1 tbsp. salt; into the second saucepan, add red wine vinegar and 1 tbsp. salt. Clean outside of beets to remove dirt or debris. Add yellow beet to saucepan with white vinegar; add red beet to second saucepan. Bring both to a boil. Reduce heat and simmer beets 45 min. to 1 hr. or until they are fork-tender. Remove beets from water; while still hot, peel beets. Allow beets to cool. Slice yellow beet on a mandolin about 1/4-in. thick. With a small ring mold, cut each slice into a perfect circle. Set aside a few slices and cut into small dice for garnish. Chop the red beet and place in blender. Add a little salt and enough water to blend into a smooth puree. Chill well assembling ravioli. Lay out yellow beet slices and place 1/2 oz. goat cheese in center of half the slices. Lay the other slice on top and press to seal edges. For service, spread red beet puree with small offset spatula across each plate. Place ravioli over puree at one end of plate. Toss celery leaves, parsley and yellow leaves of frisee with olive oil and salt and place next to ravioli. Garnish plate with diced yellow beets and micro cilantro; sprinkle micro fennel and shaved pistachios over top.